Ithaca, N.Y.; March 22, 2018. From responding to Lake Ontario landowners impacted by high water levels and providing green infrastructure retrofitting guidance to the City of Rochester and Monroe County to Great Lakes Basin Bins for teachers and a new king salmon video for anglers and researchers, New York Sea Grant provides a broad range of coastal issues education extension to assist stakeholders in the Great Lakes region of New York State. New York Sea Grant has recently posted 17 project profiles demonstrating the benefits of its work with waterfront communities and business owners, municipalities, agencies, K-college educators and students, anglers and fisheries managers, and environmental engineers. The profiles are online at www.nyseagrant.org/successstories. “This 2017 project impact series demonstrates the diverse ways New York Sea Grant Extension professionals develop new means to meet the scientific and technical needs of their communities. We look forward to working with coastal residents, teachers, businesses and local governments to continue this success in 2018,” said New York Sea Grant Associate Director Katherine Bunting-Howarth, an assistant director of Cornell University Cooperative Extension, Ithaca, N.Y.
. development of a NYSG king salmon video, showcasing the application of pop-off satellite tagging to better understand the sportfish that constitutes arguably the most important Lake Ontario fishery. Profiles for the downstate marine district highlight projects focused on sustainable NY fisheries and aquaculture, seafood and shellfish industry education, Long Island Sound coastal restoration, and building localized climate resiliency for New York City communities and schools. 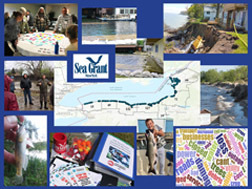 New York Sea Grant is a cooperative program of Cornell University and the State University of New York, with Great Lakes offices in Oswego, Newark, and Buffalo, NY. For updates on activities and resources, www.nyseagrant.org has RSS, Facebook, Twitter, and YouTube links. 0 Comments to " High Water Response Noted: Great Lakes Impact Profiles Posted by New York Sea Grant"